In childhood, there were always those who came home from play with a pocketful of rocks. (One predictor of becoming a successful geologist must be “tolerant Mom.”) A pity no one in that place, at that time, thought of recommending geology to young women as a career! Well, I still come home from walks with pockets full of rocks. 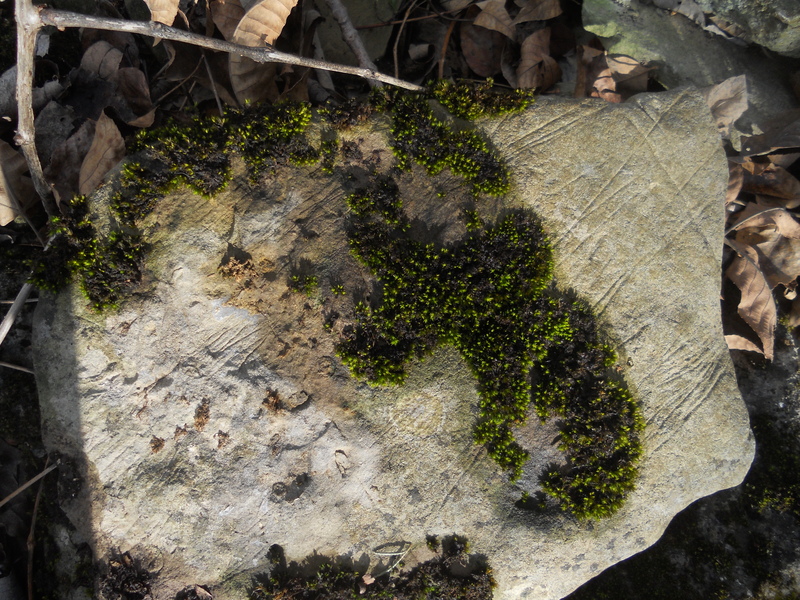 And rocks often intrude on the garden work (see below). Lately, encouragement from friends has revived my interest in geology, never really dormant. 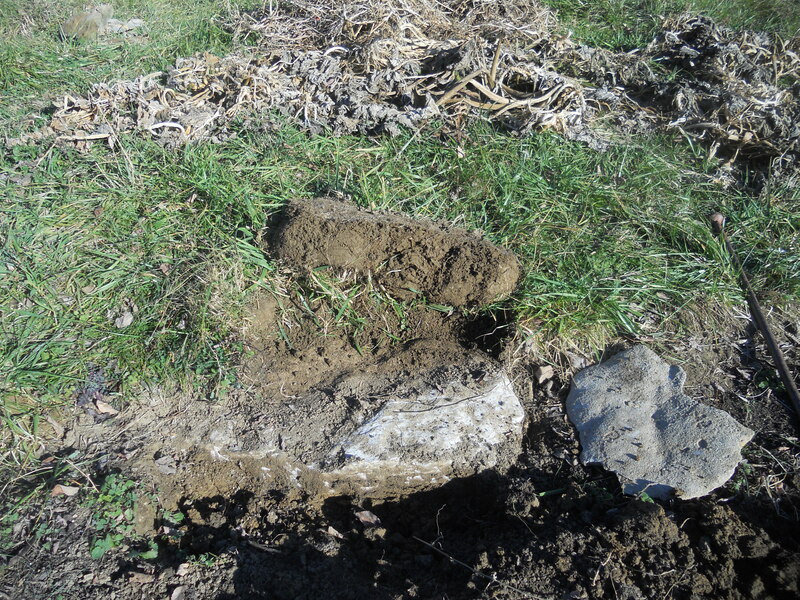 Our dense clay (with a decade of tillage and compost, it makes good garden dirt) covers, to a depth of 2 to 5 meters, some 3000 feet of sediment from a single period, the Ordovician, when most of Ohio and Kentucky was covered by shallow tropical seas. It makes for fairly monotonous fossil hunting, when rocks everywhere yield the same shattered corals and mollusk shells. Still, all that calcium gets due credit for weathering into the dense rich soil that supports pasture, garden, goats, horses, bees, vegetables and us. 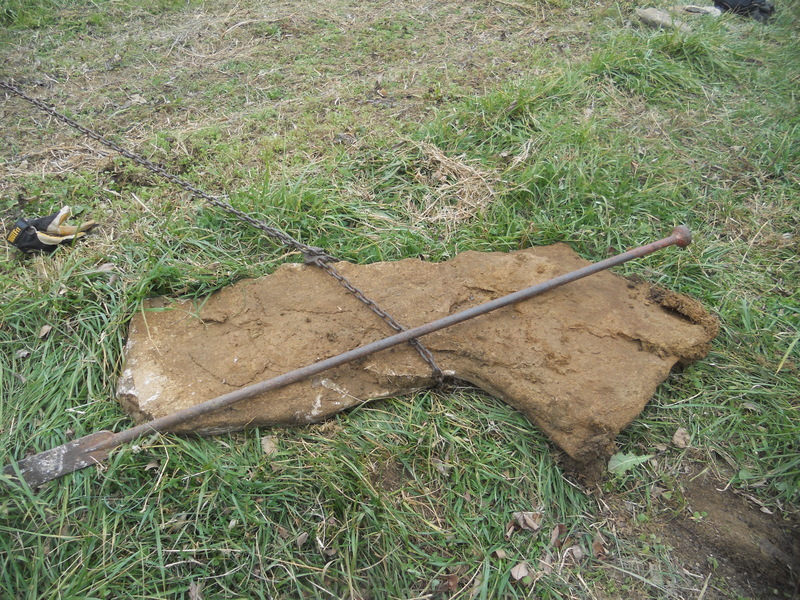 That’s Kentucky geology for you: huge slabs work up into the soil of the garden and have to be uncovered and removed. 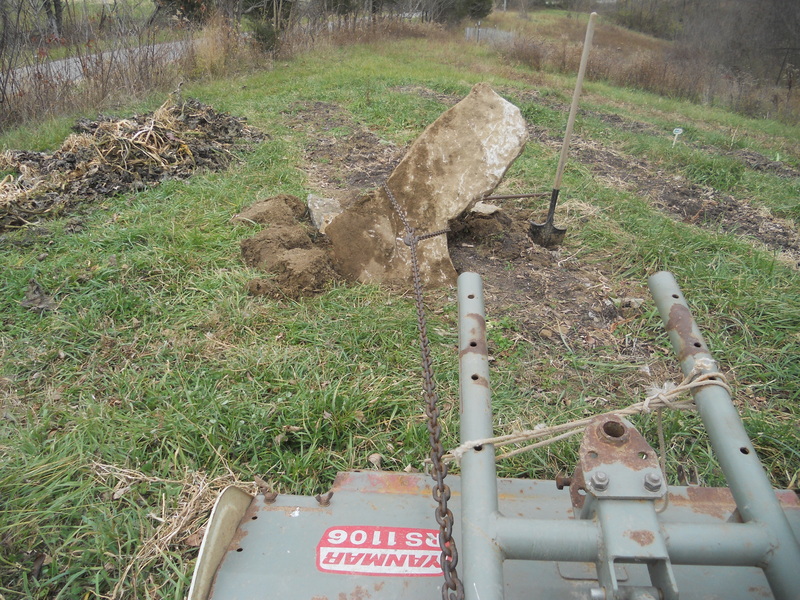 And this one isn’t coming out with just a shovel: time for tractor support. For scale, the indispensable item called a spud bar is 6 ft long (1.8 m.). 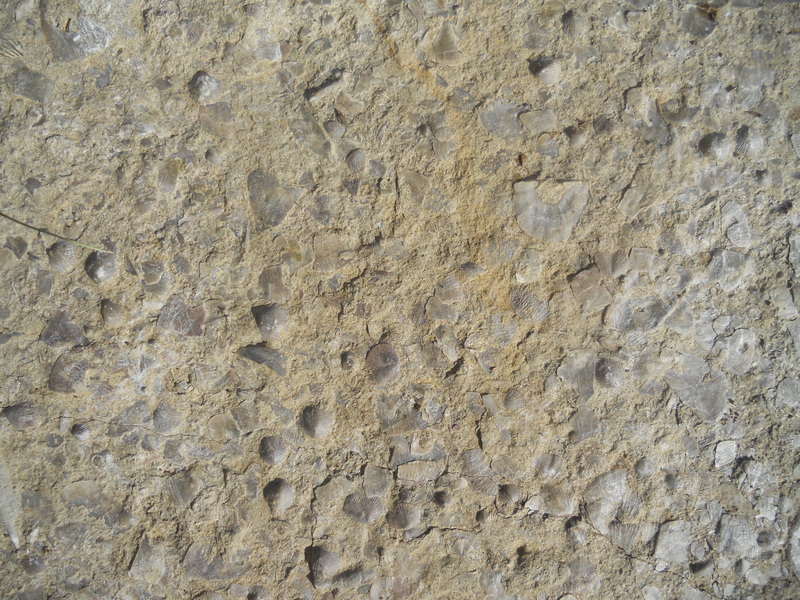 Entire layers are composed of shells of small brachiopods. 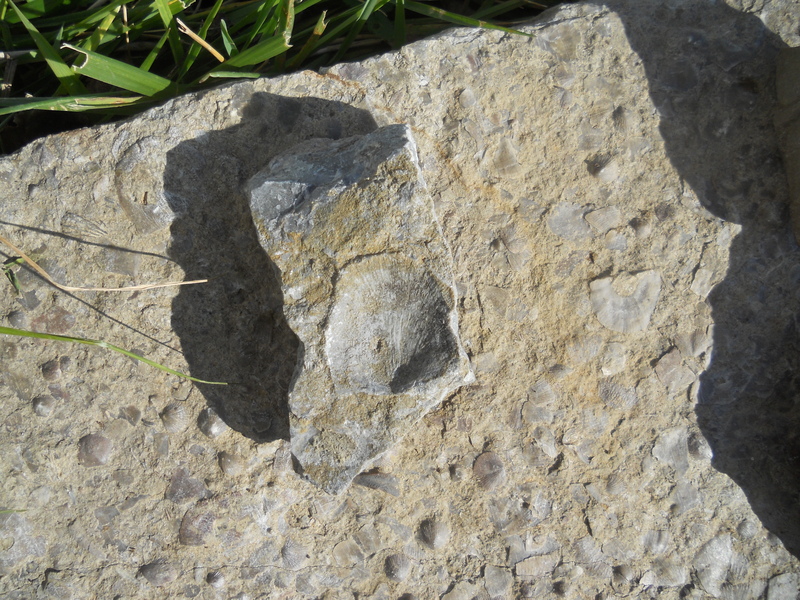 In the Upper Ordovician, bivalves have become more common. A more rare find, Orthoceras, possible ancestor of ammonite, squid or octopus: actually the macro-predator of the ancient sea. On yesterday’s hike to gather greenery, a few things got settled about all this. No, I’m not shopping for a display cabinet: the thing for me is to find, identify and relate, not collect. No, I’m not going to travel Kentucky in search of other ages and specimens (though I do keep a rock hammer in the truck for tempting road cuts). But I’ve come to think of the Ordovician with its amazing abundance of shelled creatures, as part of time here, like the fragments of oxidized glass and stoneware. or the flint points – the deep part. I want to know these creatures by name, as I know the weeds, trees and insects, and how they related: for example, were the infrequent cephalopods the top of the food chain, hunting and devouring fragile sea lilies ? Why did this epicratonic sea apparently not support trilobites, the most successful life form in all of world history? And I can’t resist passing along a handy reply, if you run across anyone who thinks a.) all this could happen in 6,000 years, or b.) that 6-foot slab of calcified shells was left by 40 days of high water. To wit: if the Ordovician, for example, lasted only 456 years, then just by the math, the mud that lay at the bottom of the pond when we moved here in 1988 ought to be rock by now. Anyone want to go check? 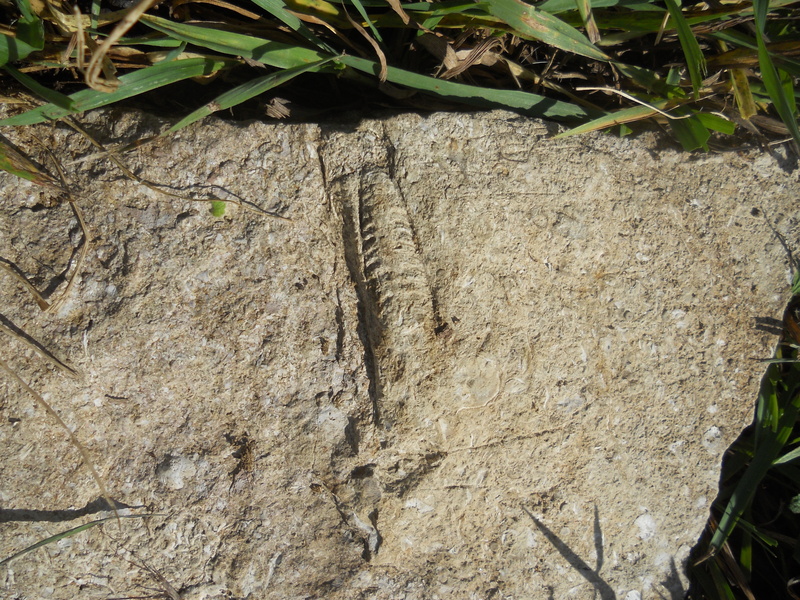 There among them were 5 or 6 unmistakable trilobite tail sections. Picture soon!